Can you also say "La koloro malbelas"? That's "The ugly color," yes? Actually, most adjectives can be converted into verbs, and frequently are. The color is ugly. = La koloro estas malbela, aŭ la koloro malbelas. Sorry, didn't notice the s at the end. Esperanto makes good use of spelling, but sometimes our own brains just don't work well enough to see the obvious. They can be, theoretically, but you have to be careful because adjectives they don't always mean the same thing when they become verbs. I don't quite understand why in this case it's wrong to say "La koloro ne estas bela"? Is there a fixed rule when you can say "ne estas" instead of "mal-"? The idea there is that in Esperanto, like in English, there's a difference between saying something is "not pretty" and saying it's "ugly". Just because something is not pretty doesn't mean, as the "mal-" prefix indicates, that it is the opposite of pretty- that is, ugly- that is, malbela. 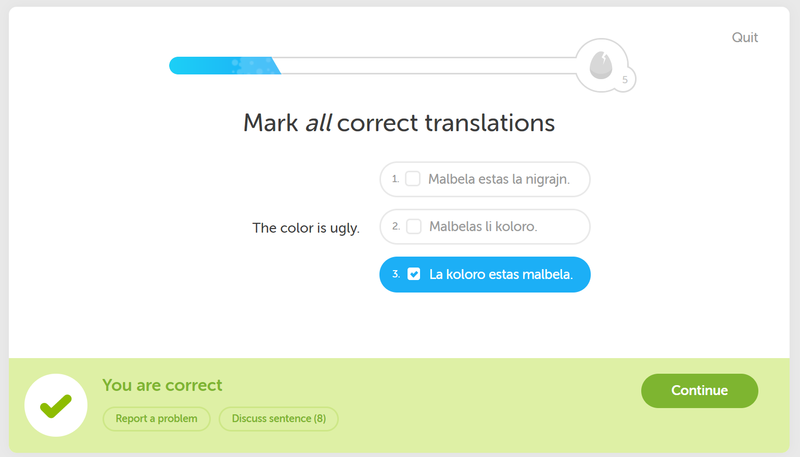 The reason, then, that you can't say "La kolorone estas bela," is that the translation for "The color is ugly" is asked for- not the translation for "The color is not pretty." There is a small but crucial difference in meaning, and therefore a difference in acceptance by the software. aaah, yes of course! now it actually makes sense to me :D thanks for your answer! So, what does the first translation mean? Would belaĉa work in place of malbela here? Not really, belaĉa would rather mean badly beautiful, like a drawing that you made in 10 seconds but doesn't look bad despite that. I said "La kolora estas mabela" and wasn't marked wrong for mixing up the o and the a, I was marked wrong for not using "malbelega" which I haven't heard before. What does that mean?